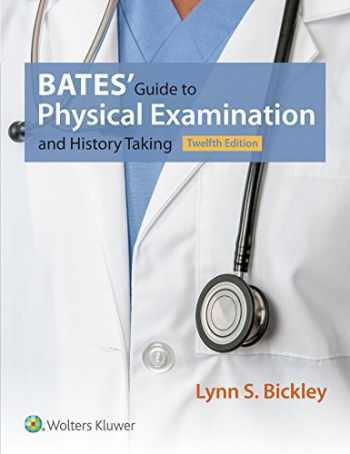 Acknowledged author Lynn S. Bickley wrote Bates' Guide to Physical Examination and History Taking comprising 1064 pages back in 2016. Textbook and etextbook are published under ISBN 146989341X and 9781469893419. Since then Bates' Guide to Physical Examination and History Taking textbook received total rating of 4.5 stars and was available to sell back to BooksRun online for the top buyback price of $51.14 or rent at the marketplace. Perform an accurate, efficient, and effective physical examination with confidence.Bates’ Guide to Physical Examination and History Taking provides authoritative, step-by-step guidance on performing the patient interview and physical examination, applying clinical reasoning, shared decision-making, and other core assessment skills—all based on a firm understanding of clinical evidence. This highly regarded text includes fully illustrated, step-by-step techniques that outline the correct performance of the physical examination and an easy-to-follow two-column format featuring examination techniques on the left and abnormalities (clearly indicated in red) with differential diagnoses on the right. Bates’ also includes a unit on special populations, covering special stages in the life cycle—infancy through adolescence, pregnancy, and aging. Clinical pearls , printed in blue, highlight key points throughout the text.Text boxes help readers quickly find important summaries of clinical conditions and tips for challenging examination techniques.Many new and updated photographs and illustrations support the text, and figures are now numbered for easy identification and reference. Rewritten chapter on evaluating clinical evidence clarifies key concepts to ensure student understanding.Revised and expanded chapter on the skin, hair, and nails includes new dermatology photographs and provides the framework for assessing common lesions and abnormalities.Updated behavior and mental status chapter now references DSM-5 .Significantly revised information on obesity and nutrition counseling; cardiovascular risk factor screening and new clinical guidelines; new screening guidelines for breast cancer, colon cancer, Papanicolau smears, and stroke risk factors; updated information on STIs; new geriatric assessment tools; and much more.New life cycle content , including an increased emphasis on cardiovascular health promotion and child development; updated pregnancy topics such as weight gain, substance abuse, and intimate partner violence; and new information on the older adult, including frailty, immunizations, cancer screening, cognitive decline and dementia screening, and a new algorithm for falls prevention. Bates’ Guide to Physical Examination and History Taking is the #1 choice for complete, authoritative guidance on mastering every aspect of the all-important physical examination. Don’t Miss These Additional Resources also Available for Purchase:Bates’ Pocket Guide to Physical Examination and History Taking, Eighth EditionThe Pocket Guide is an abbreviated version of the Bates’ twelfth edition textbook, designed for portability and convenience at the bedside.Bates’ Visual Guide to Physical Examination (www.batesvisualguide.com)Recently refilmed, these 18 volumes of examination videos (as well as 10 additional OSCEs) depict experienced clinicians conducting each of the regional examinations. The videos demonstrate visually the varying techniques of inspection, palpation, percussion, and auscultation in the regional examinations and special populations.